5. A Sunset. Took this from the doorway of our caravan. not a particularly inflamed sunset but I like it. We went to Manor House Wildlife Park, just outside Tenby - or as we say in Welsh Dinbych-y-Pisgod. The Meerkats were all sprawled out in the sun except one who was up on the tree stump on duty. They changed places every so often and took it in turns to be on guard duty. A quick check of my list tells me that I seem to have only four left to find..... I wonder which one I will fail on this year. 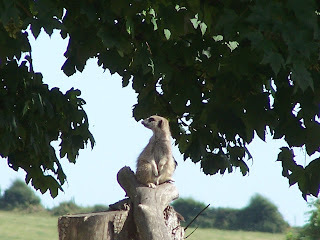 I have never seen a live meerkat - great pose! You are doing so well so far - don't give up now! Great finds! Don't forget to link up on Wednesday. Of course you won't fail! Meerkats are just so wonderful, Love the sunset too and is that police woman really that tall or is the angle of the photograph? It's funny isn't it - what we consider a 'proper' sunset! I was hoping for a glorious one to photograph myself - yet the sun sets every night and they can't all be the picture postcard versions! I went to great lengths to hang around for one one night but that sun takes its own time to actually 'set'! I've got just one left to capture - you keep going! The meerkats are cute, but I love how you've used Miss Em to capture the police woman. You've almost got 'em all now! The meerkat is so cute!!! Love it. Nice way to link up! I am going to show my kids your photos because they LOVE meerkats! I really like your commentary regarding the second shot ... sometimes we need 'props' as a ruse to get the shot we want!